The offshore oil and gas industry requires access to deepwater equipment, instruments, and services to support environmental monitoring for life of field activities, including exploratory drilling, development activities, and production. Equipment and instruments that can probe deepwater areas are highly specialized and require dedicated maintenance, mobilization, and deployment services to ensure utility, safety, and data quality. Rapid mobilization of such equipment is particularly important in the event of an accidental offshore hydrocarbon release. 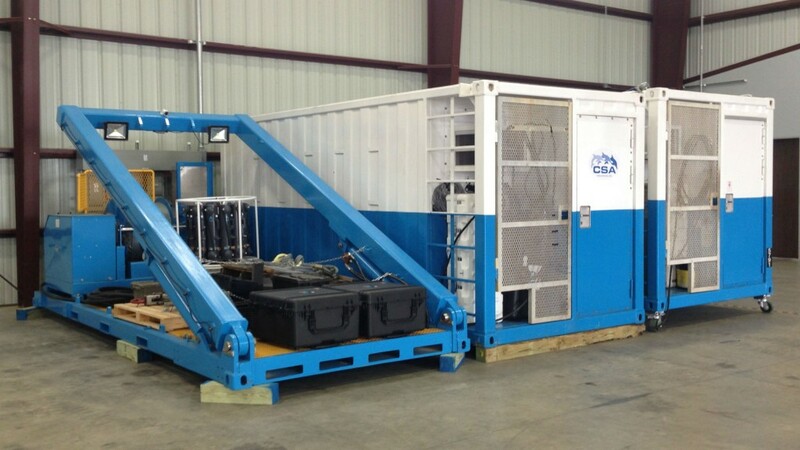 The solution delivered by CSA and HWCG is a "three lift" system consisting of an Operations Container, Laboratory Container, and Launch and Recovery System (LARS) that can be transported to a Gulf of Mexico seaport within hours of an incident and outfitted on an offshore supply vessel. The containers and LARS enable offshore scientific and operations personnel to collect in situ measurements of fluorescence, turbidity, particle size, and dissolved gases from the sea surface to the seafloor. These data can characterize water column conditions and identify the potential presence of subsea oil, information that is crucial to planning the response and mitigating the effects from deepwater oil spills in a subsea environment. Even the deepest waters of the Gulf of Mexico (up to 3,000 m) can be sampled and monitored with this equipment. CSA will maintain the equipment on standby for HWCG members and will provide mobilization and deployment services should the equipment be needed for a response. "By developing this rapid environmental monitoring solution, HWCG has ensured that its members have access to the equipment and services required for environmental preparedness and response," said Dr. Jodi Harney, Energy Director at CSA Ocean Sciences Inc. and manager of the project. "CSA is proud to serve the environmental needs of the offshore industry."